I've always thought macaroni and cheese's 20% crunch to 80% soft ratio was all wrong. The ratio should be more like 50:50. The soft part, delicious though it may be, wears you out. You need lots of crisp bits to stay interested in the dish. 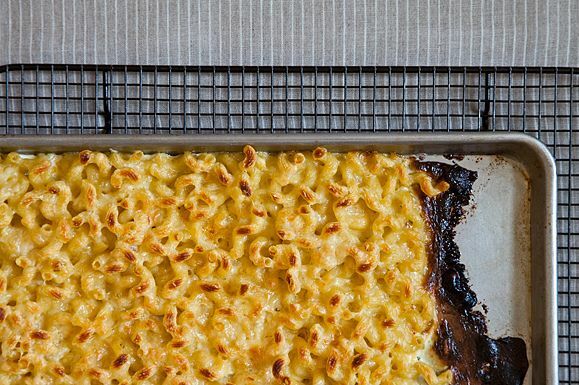 In an effort to realign macaroni and cheese, I brought together three concepts: a baked pasta technique from Cucina Simpatica, a potato gratin method from Jeffrey Steingarten, Vogue's food columnist, and a similar method used by Melissa Clark for kugel. In Cucina Simpatica, pasta is par-cooked, then combined with cream, cheese and other seasonings and baked at 500 degrees. The high temperature finishes the pasta quickly and toasts the tips on the top layer -- a memorable detail. Steingarten's gratin involves roasting thinly sliced potatoes and cream on a baking sheet so that the entire gratin is crisp and handsomely browned. And Melissa Clark spreads her kugel in a baking sheet achieving a predominantly crunchy texture. Back in the macaroni and cheese lab, I combined these three ideas by par-cooking the pasta, folding it together with cream and a few cheeses, spreading it on a baking sheet, and finishing it in a 500-degree oven. The result was total success -- the muffin top of mac 'n cheese! Major world issue solved, at last. A few cooking notes: this is on the creamy side, so if you want it cheesier....add more cheese! And add whatever kind you like. I used fontina and asiago because I happened to drop by Buon Italia this week, but since those cheeses are not as easy to find, I might do cheddar next time. You can also add some diced ham, crushed tomatoes or any seasoning, really. I just kept this one simple to focus on the technique. UPDATE: I've retested this with a new cream-less recipe and think you'll like the results. See the recipe at the end of the post. 1. Heat the oven to 500 degrees. Bring a large pot of salted water to a boil. Add the pasta and cook for 6 minutes. Drain. 2. Meanwhile, in a large mixing bowl, combine the cream, fontina and asiago. Season generously with pepper. Add the pasta and stir to combine. Spread the mixture in a 11x17 rimmed baking sheet, shaking the pan to fill it evenly. Sprinkle with the Parmesan cheese. Bake until browned on top and crisp, about 15 minutes. Here I've used Julia Moskin's recipe for Crusty Macaroni and Cheese and applied my cooking method to it. See (and print and save) the recipe here. Love love love crispy mac and cheese...I like baking it in a well buttered muffin tin. Top, bottom and sides of crispy goodness with a gooey center and there is no fighting for the edge pieces. And I always, at the very end, squeeze a touch of lemon into the cheese sauce. Not enough to curdle it but just enough to freshen and zip it up. mmmmm ... crunchy crusty bits. the more the better! Everyone in the house fights for the top of the M&C and the corners of the brownies. If it wasn't 100 degrees this would be dinner - but there is NO way the oven gets turned on today. Bookmarked for cooler days - brilliant really. I'm a recent convert to mac 'n cheese so i've got to try this (and I LOVE the crunch factor) but i am dreading cleaning the pan. do you think i could bake this on parchment paper? Yes absolutely -- you may not get as much crispness on the bottom but the pan will make you happier! You may want to try using non stick aluminum foil. Reynolds makes some, I love it for any kind of baking! Alas, it's a crusty mac-n-cheese kind of day. Amanda, is there a way to print and save Round One? Sorry, I wiped it out after I made this one because I thought it was better than round one. Give this one a try! I made it - round two - and at the last minute, I stirred a handful of dry bread crumbs into the reserved cheese. It made the topping chewy/cheesy crispy as well as sandy crispy, if you know what I mean. Very wonderful. By the way, made a half recipe, and baked it on a quarter sheet pan in the toaster oven. People, don't fear the heavy cream! At 6 servings, that's 1/2 cup per, which is not going to kill you as an occasional indulgence! If it makes you feel better, do what I do and have a big salad or a pile of sauteed or steamed greens alongside it. Balance! Ok, time out! I think I've freaked everyone out with the amount of cream. So I'm going to re-work this, doing a straight-up cheese version and I'll report back in a few days. Stay tuned! Thank you! The DH just got cholesterol results back.... Would love to be able to make this for him! Did you use milk or cream? what a brilliant idea... i usually eat the top and discard the rest. Let me know if that works -- I wonder if the sauce will come together. Could be great, because my version is definitely on the rich side. I'm going to make it again with more cheese and milk instead of cream to see what happens. I must try this immediately, waistline be damned. What a krafty idea. Thanks -- let me know how it goes. You're so smart. I've always liked the top of mac and cheese better, too, but never thought about a way to make more top, less bottom. Come to think of it, I'd like to figure out that ratio for my body, too. If you figure out the latter, please do tell. We'd all love to know. What a fun twist (har) on mac & cheese!